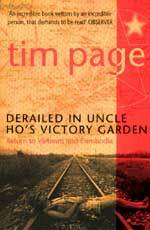 Derailed in Uncle Ho’s Victory Garden (ISBN 0-684-86024-4) is a 1999 reprinting of Tim Page’s 1995 epic description of life, lives and times in Vietnam, both before and after the ‘liberation’ of the south by the northern VC. Page was a famous war photographer who cut his photo-teeth during the Vietnam offensive, who ended up being very seriously injured and spent many years in recovery. The book moves very smartly, back and forwards in time, with snippets of the conflict years being contrasted with the post VC victory and the slow return of foreigners being allowed to travel in Vietnam. Ostensible it covers Page’s time as a war correspondent, including being hit by the ludicrously named "friendly fire", and then following his rehabilitation from head injuries, his return to Vietnam to look for Sean Flynn (son of the Errol Flynn the movie actor) who was officially recorded as MIA (missing in action). By and large, in the newspaper business, photographers cannot write (after all, why should they, since a photograph is supposed to be worth a thousand words) and the converse also holds true - writers cannot use a camera. Tim Page transcends all that. He has a mind that can bring back every small detail of a place or person or situation, and impart them onto the printed page. Truly remarkable. Examples of Page’s extreme acuity - (page 58) "We were parked for negotiation in the old frontier post at a long table beneath the gaze of uncle Ho. Two township committee lads with bad teeth busied themselves pouring hot water into a chipped and filthy teapot, having pinched some leaves from a rusty army-issue caddy." Or on page 69, his description of a roadside restaurant, "It had been raining, the odd drip still hitting the floor, which was covered in a slime of food spittings, chicken droppings and grease. The junction box consisted of two exposed wires, which the owner grabbed and wound around those trailed by the fan. There was a lovely blue acrid flash, which plunged the dank room into further gloom." Anyone who has been there will recognise the mandatory tea and cigarettes routine, forced upon every foreigner who wants to do anything in that part of the world. The review copy was made available by Bookazine and has an RRP of 475 baht. Having been in Vietnam in 1990, I can vouch for the authenticity of his descriptions, a country where sending a fax used to take four hours from its going into the government owned facsimile machine, to its emerging at its destination overseas. For those who missed the years of conflict, there is also a glossary at the back of the book to explain some of the war’s acronyms, such as ARVN or Minf. There are also maps showing the main regions covered by the book. If you need a historical record of Vietnam in the late 60’s and early 70’s and then again the early 90’s, this book depicts the real Vietnam situation of those times. A very powerful record that deserves its place in Vietnam history too. This only left bandleader and guitarist Kim Simmonds and piano player Bob Hall, who was never really a full time member of the band, preferring to keep his options open to be available for his very lucrative session work, from the band that recorded the debut album. But if it was Kim Simmonds’ quest to find the perfect British Blues and Boogie Band, one listen to this album will leave you in no doubt that he was already coming very close. Although this lineup of ‘Savoy Brown’ had only been together a matter of days, the Decca Record Company put them in the studio with legendary producer Mike Vernon (Fleetwood Mac, John Mayall, etc) to record this classic album. Right from the get go, when the band bump and grind their way into opener "Flood in Houston", you know that you are listening to something very special. The band has a chemistry that makes you feel they have been together for a lifetime. Youlden’s voice on this and the next three Savoy Brown albums put him up there with all of the great blues singers (many comparing him favorably with the great Bobby Bland). The guitar playing of Peverett and Simmonds was the equal of anything Clapton or Green were doing at the time. Jobe and Earl held down a rock solid backbone, whilst Hall’s piano work shows why he was held in such high regard by his contemporary musicians. The music is probably best summed up by the eight minute long "You need Love", the old Willie Dixon chestnut, which rushes off at a brisk twelve bar, whilst Youlden explains to the object of his desires why she needs his affections, before Simmonds takes over with a blistering guitar solo, giving way to a thundering bass section from Jobe. A pulsating drum solo from Earl leads us into a ‘dueling banjo style’ guitar battle between Simmonds and Peverett. Then the whole band come back to bring the song to a fitting climax. For the CD release three extra tracks have been added onto the original release. A cover of Lane’s "Walking by myself" made famous on Gary Moore’s album "Blues Alive" and now a staple of Pattaya’s own Pop Jorilia’s band "Satin Soul". A wonderful Youlden original "Taste and Try, before you Buy", which could be Hendrix at his sauciest, and a great Simmonds blues jam "Someday People". So not only are you getting great music, you get great value for money too. Kim Simmonds still leads Savoy Brown today (probably on lineup number 467 by now). Dave Peverett, Roger Earl with Jobe’s replacement Tone Stevens went and left Savoy Brown in 1970 to find superstardom in "Foghat". Sadly, over the years Chris Youlden has released three patchy solo albums to no great avail. But whilst they were together, these boys could really play.